Sir Christopher Frank Carandini Lee CBE, CStJ (27 May 1922 – 7 June 2015) was an English actor. He was a direct descendent of Marie Carandini and Robert E. Lee. Lee was best known for his many movie characters. For example, Dracula and Fu Manchu in many movies during the 1950s through the 1970s. 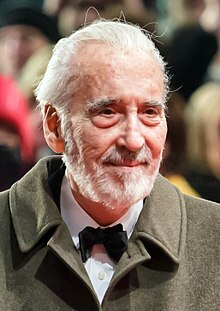 He became even better known as Scaramanga in the Bond movie The Man with the Golden Gun, Saruman the White in The Lord of the Rings trilogy and Count Dooku in Star Wars Episode II: Attack of the Clones. He performed roles in 275 movies since 1946. He appeared in over 75 television programs. Lee was also a voice actor, providing his voice in over 50 movies. This made him the Guinness World Record holder for most movie acting roles ever. Lee was also a singer and his latest album was released in 2013. Lee lived in London. He was married to Danish model Birgit Kroencke. Lee was born in Belgravia, London, England. He and his older sister Xandra were raised by Estelle Marie and Geoffrey Trollope until their divorce in 1926. Trollope was a professional soldier. Later, while Lee was still a child, his mother married (and later divorced) Harcourt George "Ingle" St. Croix, a banker. Lee studied at Wellington College from age 14 to 17. After this, he worked as an office clerk in a couple of London shipping companies. In 1941, he enlisted in the RAF during World War II. After military service, Lee joined the Rank Organisation in 1947. He trained as an actor in their "Charm School". He played many small parts in movies, for example, Corridor of Mirrors (1948). He had a small part in Laurence Olivier's Hamlet (1948). Peter Cushing was also in this movie. Lee and Cushing also both acted in Moulin Rouge (1952) but did not meet until later when they did horror movies together. They are well known for working together in horror movies. Lee had many parts in movies and television during the 1950s. He did not become famous until he started working with Hammer Film Productions. With Hammer Films, he acted in The Curse of Frankenstein (1957), Dracula (1958), The Mummy (1959), and The Hound of the Baskervilles (1959). All of these movies also starred Cushing. Lee continued his role as "Dracula" in many Hammer sequels during the 1960s and early 1970s. During this time, he acted many times as Fu Manchu. The most notable was in the first of the series The Face of Fu Manchu (1965). He also acted in many movies in Europe. With his own production company, Charlemagne Productions, Ltd., Lee made Nothing But the Night (1972) and To the Devil a Daughter (1976). By the mid-1970s, Lee wanted to stop making horror movies. He acted in several mainstream movies, for example The Private Life of Sherlock Holmes (1970), The Three Musketeers (1973), The Four Musketeers (1974), and the James Bond movie The Man with the Golden Gun (1974). Because these movies were very well liked, he chose to move to Hollywood in the mid-1970s. He was a busy actor but most of the work he did for movies and television was not very notable. Because of this, he decided moved back to England. Lee's career became very notable again in the early 2000s. His acting in The Lord of the Rings movie trilogy (2001–2003) (as Saruman the White) and Star Wars Episode II: Attack of the Clones (2002) (as Count Dooku) caused this. Lee is the only member of the cast of "The Lord of the Rings" trilogy who met author J.R.R. Tolkien. Lee died at the Chelsea and Westminster Hospital on 7 June 2015 at 8:30 am after being admitted for respiratory problems and heart failure, shortly after celebrating his 93rd birthday there. His wife delayed the public announcement until 11 June, in order to break the news to their family. In 2001, he was made a Commander of the Order of the British Empire for his contributions to the movie and television industries. He was knighted for services to drama and charity in 2009. He received the BAFTA Fellowship in 2011. ↑ "British actors in Guinness records". metro.co.uk. Retrieved 13 April 2012. This page was last changed on 11 January 2019, at 10:37.